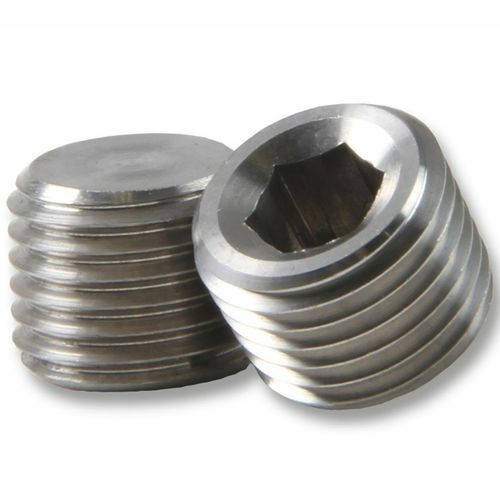 Internal hex plug stainless steel pipe fitting is for closing the end of a female threaded pipe or fitting. Internal head shape is countersunk and hexagonal for increased leverage with a wrench during installation and disassembly. Stainless steel pipe fitting is suitable for use in high-pressure and high-temperature applications. Thread sizes range is from R, PT, BSPT 1/8 to R, PT, BSPT 1/2, 10-32 UNF to 1/2 NPT, G, BSP, BSPP 1/8 to BSP, BSPP 1/2.